“We’ve got to keep causing good trouble,” U.S. Labor Secretary Tom Perez told a crowd of Howard County Democrats Wednesday night in a fiery speech meant to encourage fight for progressive ideas. A talk by a federal cabinet secretary sounds like a snooze. 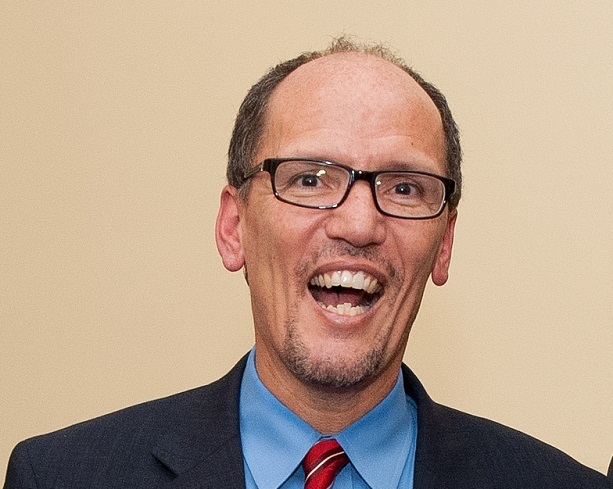 But taking the evening’s theme, “Why I am Democrat,” Perez sounded more like the statewide political candidate he was back in 2006 than a man whose department includes the Bureau of Labor Statistics and the Employee Benefits Security Administration. Speaking of his 2006 race, Perez encouraged the packed house to check out the eligibility requirements for any office they might run for and don’t rely on opinions from the attorney general’s office. Perez, then a Montgomery County Council member, got knocked off the ballot in his race against Doug Gansler for state attorney general when the Court of Appeals ruled he hadn’t had the requisite experience practicing law in Maryland for 10 years. “I encourage you all to get kicked out of a race,” Perez said facetiously. When that door closed, he said it opened opportunities, first as Maryland secretary of Labor, Licensing and Regulation under Gov. Martin O’Malley working on foreclosure issues, then as assistant U.S. attorney general for civil rights. Talking without notes, he spieled off a string of anecdotes about individuals who had gotten jobs and gone back to work through job training, the federal stimulus program or with health care covered by the Affordable Care Act. These programs have led to 62 straight months of employment growth, and he contrasted this with Republicans who opposed the stimulus program, access to health care and bailing out the U.S. auto industry. He noted that GOP presidential nominee Mitt Romney had claimed that Jeeps would soon be made in China, but Perez said, now “the only things going to China” are the Jeeps being made in the U.S.
“We are the party of ‘we’ and they are the party of ‘I,'” Perez said. He turned to state issues, saying “we [Democrats] don’t leave money on the table,” an apparent reference to Republican Gov. Larry Hogan’s failure to spend all the education funding the legislature had appropriated. “We’ve got to continue to invest” in infrastructure such as the Port of Baltimore and mass transit. The annual Jefferson-Jackson Day dinner in a Clarksville ballroom had its best attendance in years. Howard County Democratic Party Chair Abby Hendrix attributed that to a new active group of Central Committee members who worked hard to sell out the 250 seats. Attorney General Brian Frosh got the Senator James Clark Award, named for the late senator who had served as Senate president. “I don’t feel I’ve earned this yet,” Frosh said, since he only took office in January. The award singled out his work as a longtime legislator on progressive issues such as environmental protection and gun control. In a brief interview, Frosh said his main concern now is how to overturn the decision by the Public Service Commission to approve the merger of Pepco utility with Exelon, which already owns BGE. Frosh considers the deal bad for consumers. The liberal Democrat said he has yet to run into any major disagreements with the Republican Hogan administration, though that, he said, could happen later. The James W. Rouse Community Builder award went to former Baltimore Sun reporter Larry Carson, who in retirement has become a party activist. The Howard County Democrat of the year was Mae Beale, who worked to get many Democrats elected.